Add some tactile control to your software setup with the Nocturn. Novation has expanded its MIDI controller line-up with the launch of the Nocturn. Designed specifically for tweaking your instrument and effect plug-ins, this makes use of the company's new Automap Universal 2.0 software. The Nocturn is equipped with eight touch-sensitive rotary encoders, each of which is surrounded by a ring of 11 LEDs for instant visual feedback. 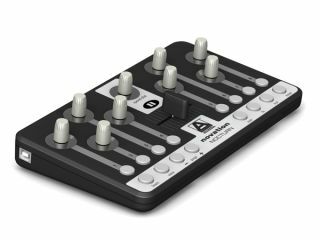 There are also eight user-definable illuminated buttons and - for the benefit of DJs, we assume - a 45mm crossfader. Also onboard is what Novation is calling the 'speed dial'. This is a further touch-sensitive rotary encoder that automatically adjusts whatever parameter your mouse is currently focusing on. Novation has side-mounted the Nocturn's USB socket so that you can easily position the unit in front of your QWERTY keyboard. Its low-profile design should mean that it won't get in the way when you're trying to type. Look out for Nocturn in the first quarter of 2008. You can get pricing details from your local Novation distributor - go to the Novation website to find out who this is.